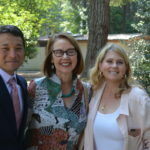 Oregon Attorney General Ellen Rosenblum, ODOT director Matt Garrett and members of the Oregon Travel Information Council joined the Oregon Heritage Tree Committee to commemorate the day and induct the Grove as Heritage Trees. 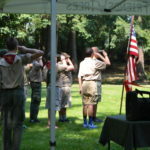 The local Boy Scout Troop 194 served as the Color Guard for the event. We were fortunate to have Tom Thornton join us as well. 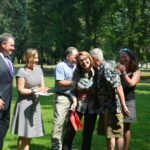 Thornton is the son of former Oregon Attorney General Robert Y. Thornton who spearhead the creation of the Grove of the States fifty years ago. 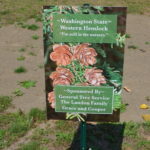 Located at the southbound I-5 French Prairie Rest Area (at Milepost 281 near Wilsonville) the Grove is believed to be the oldest public arboretum of state trees in the US. Thornton was hosting a conference of US Attorneys General, and representatives from across the US were present at the original dedication of the Grove on August 28, 1967. Thornton envisioned the Grove as a way to honor Lady Bird Johnson’s 1965 Highway Beautification Act. 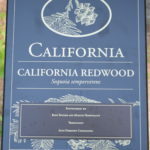 When the Grove was planted in 1967, planners did not provide enough space for the new trees to grow into their mature height. 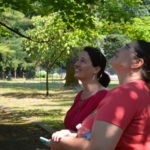 Over the years, some of the larger species and encroaching Douglas fir trees out-competed their neighbors for sunlight and many of the trees became unhealthy, or died. 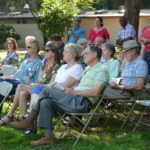 Preparing for the Grove’s 50th anniversary, the Oregon Travel Information Council (DBA Oregon Travel Experience) and its partners at the Oregon Department of Forestry, Friends of Trees, Oregon State University and other history and tree lovers have joined efforts to save the Grove for future generations. 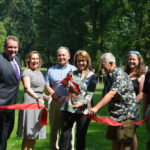 Paul Ries with Oregon State University’s Urban Forestry Program and President-Elect of the International Society of Arboriculture (ISA), said, “The Grove is a unique collection of trees and needed significant help to bring it back to full health. 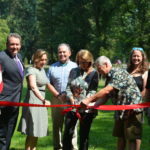 The work performed by volunteers over the past two years was essential to the restoration of this important cultural and historical resource,” says Ries. 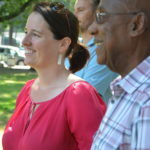 OTE’s Annie von Domitz, the Grove’s restoration project manager, says that full restoration wouldn’t have been possible if not for the hundreds of volunteer hours that the Grove of the States Restoration Project Team members, local arborists and other tree lovers have donated to the effort. The restoration is nearly complete. The construction of a new path is planned for this fall along with the installation of signage. 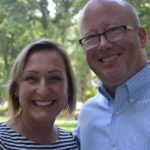 Von Domitz adds that opportunities abound for those interested in preserving this important historical asset. 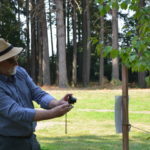 “People who love trees or appreciate Oregon history can help us with the restoration by becoming a Grove of the States sponsor,” says von Domitz. “Sponsorships exist at all levels, including sponsorship of individual state trees,” says von Domitz. 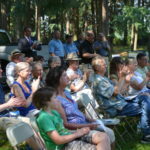 “We also have corporate sponsorships available, and local businesses can contribute to new Grove of the States interpretive signs at the rest area,” she adds. Oregon Travel Experience operates 29 rest areas at 17 locations around Oregon, including the French Prairie rest area housing the Grove. 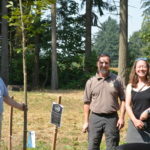 OTE also administers Oregon’s Heritage Tree Program. For more information or to get involved in the restoration project, contact Annie von Domitz at 503-373-0864 or email anniev@oregonte.com.